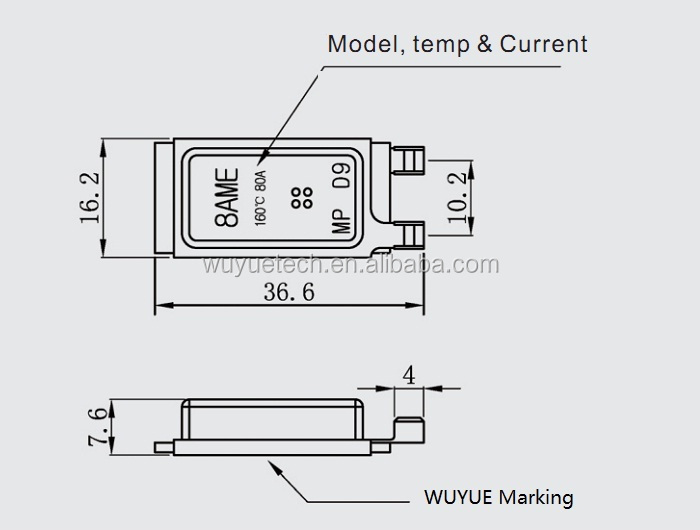 Custom and Cheap Surface mounting bimetallic thermostat 8AME for auto motor Supplier and Manufacturer.--Yangzhou Wuyue Electric Co., Ltd.
8AME series big current thermostat is designed for big current applications. It has high quality bimetal and contacts, that can withstand big current. The max working current can be 40A and overload current can be 80A. This special property makes it can be used in motors or heating elements which need bigger current, like washing machine motor, high power heating elements etc. 1. Temperature protection When ambient temperature exceeds the specified value, the inside bimetal of 8AME series will trip off to cut the circuit. When the temperature lowers down, the bimetal will reset and the circuit is connected again. 2. Current protection Auxiliary heater works together with bimetal, which can control the trip off time precisely. When the current exceeds the prescribed value, 8AME will cut the circuit immediately.